Drew's first birthday party invitations arrived last week. Goodness, they are perfect! We are throwing Drew a Popsicle pool party as a celebration of her sweet loving, swimming self. With school starting and summer coming to an end, I can't wait to have one last hurrah at Drew's favorite spot for her big day. The invitations are A+ in quality and style. I decided to go with a "summer party invite" and turn it into a "first birthday invite." It was as easy as could be. I just told Tiny Prints what I wanted the invitation to say and where I wanted Drew's pictures to go and they did all of the work! I still had the photo card look on the back which is my favorite, of course. Who doesn't want to see those chubba cheeks in their mail box?? And what is a Popsicle pool party without a Popsicle "bikini!" This swimsuit looks rather small for my baby girl. Would you believe it is a size 18 month?? She's not even a year! What can I say, my baby loves meal time. And snack time. And cheerio, cheese, chicken, and ice cream time. 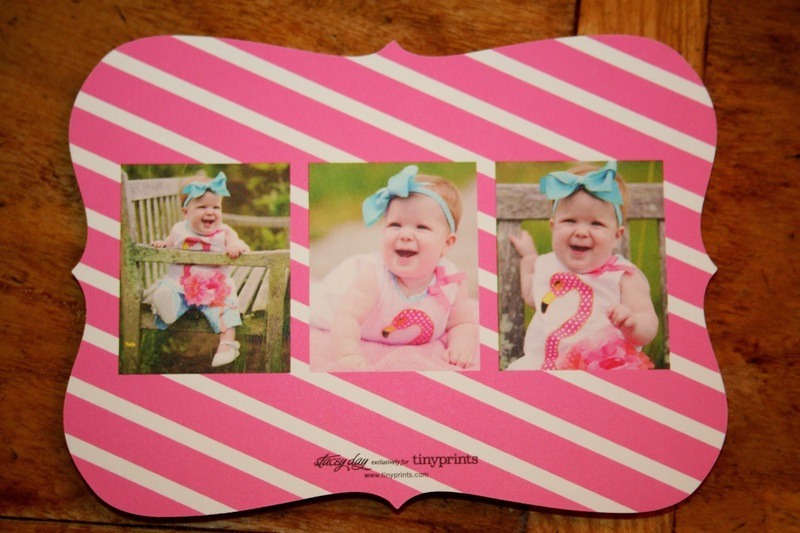 I am thrilled with these super adorable invitations!